At Mayflower Venues, we are all about helping couples discover nontraditional outdoor wedding venues. We also offer the tools and online support to help them create custom weddings there. This means, we have come to know a thing or two about forest weddings. We believe nontraditional outdoor venues give couples the chance to really create a wedding day that can be customized to reflect their values and story (in a way busy commercial event spaces cannot). That freedom to be creative and express your values is only heightened when the wedding can take place outdoors and the couple has the chance to turn a blank canvas into a real life story. 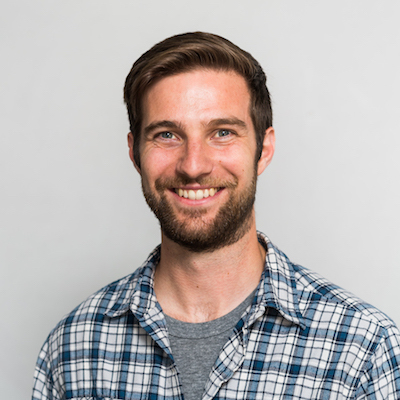 Plus, for a lot of us, the outdoors are a huge part of who we are and we want to bring that value and passion into our wedding day. So whether you love to hike, picnic or just walk your dog in the woods, we have some nontraditional forest venues we think you might love. 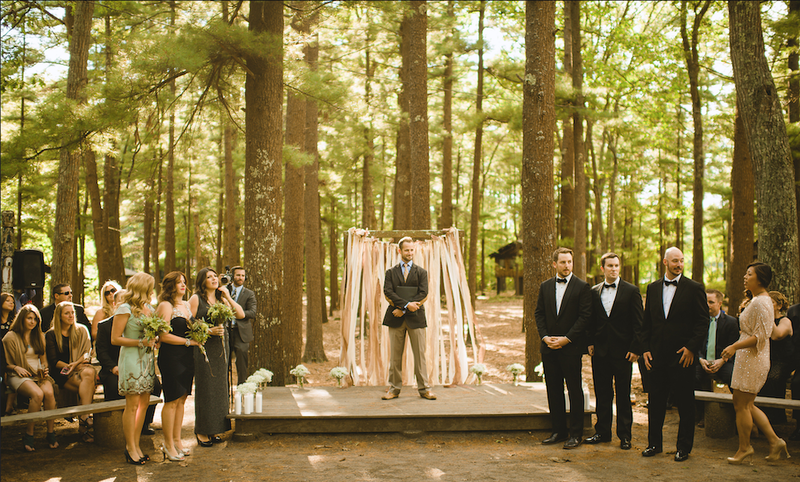 Whether it's a forest ceremony with soft violins and long wood benches or a glass tent that lets guests peek through the towering white pines to the stars, forest ceremonies are some of our favorites! Drop a comment or chat/email us from our website if you have questions. 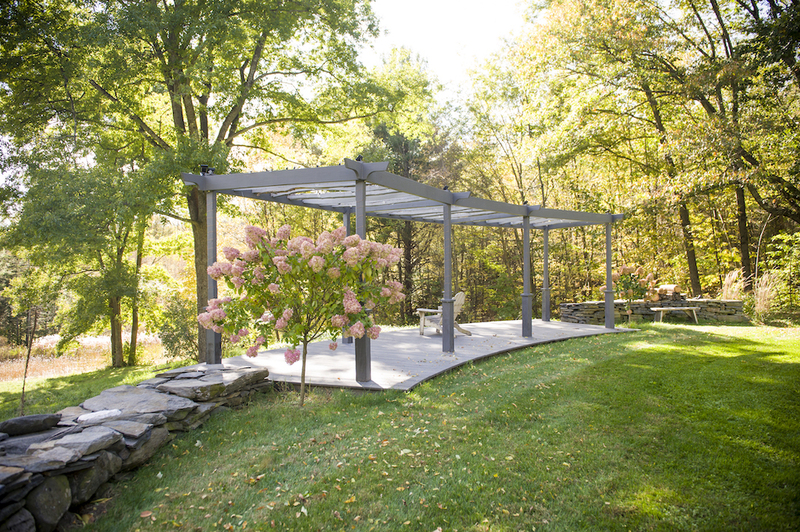 Private forests with flower covered terraces and pergolas, Artist's Escape in Ashfield lets couples bring their guests into the forests of the Berkshires with all the elegant beauty of manicured gardens and terraces. You can have cocktails under morning glory blossoms looking at ancient poplars and oaks, and have an intimate ceremony shrowded in the privacy and peacefullness of a the towering pines that surround the property. With a private outdoor cabana (separated from the woods by only screens!) you have the perfect nature setting for getting ready with your bridal party or simply relaxing with a drink after customizing the ceremony and reception setup the day before (each Mayflower Venue comes with 24 hours of free setup access the day before your wedding to ensure you can really customize the space with your vendors and decorations). Truly a forest wedding venue, Camp at Forest Pines offers couples the chance to create either a more rustic wedding venue or elegant woodsy wedding day. With the 100 foot pines allowing light to shimmer through to the golden needles on the forest floor, guests will feel a complete sense of privacy and focus. No distractions and the true calm of a quiet forest setting. 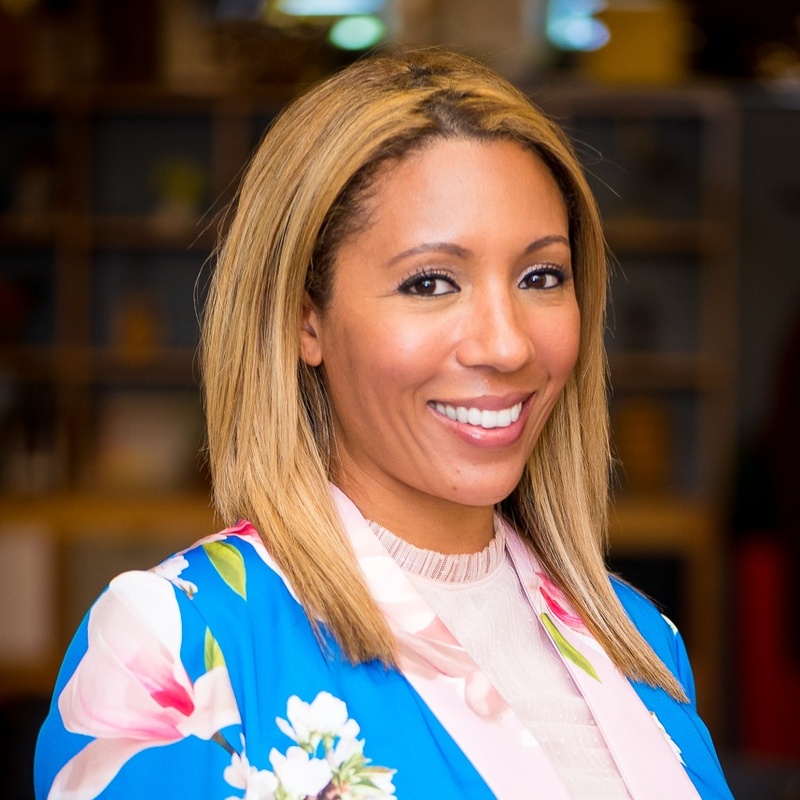 You can have soft music for a ceremony to blend with the birds in the woods or setup for a lakeside view with woods backdroping the placid waters of your summer camp venue. After all the dancing and music quiets down under the stars, your guests can meander back to their own private cabins or keep the party going with a final drink (or s'more!) around the campfire. 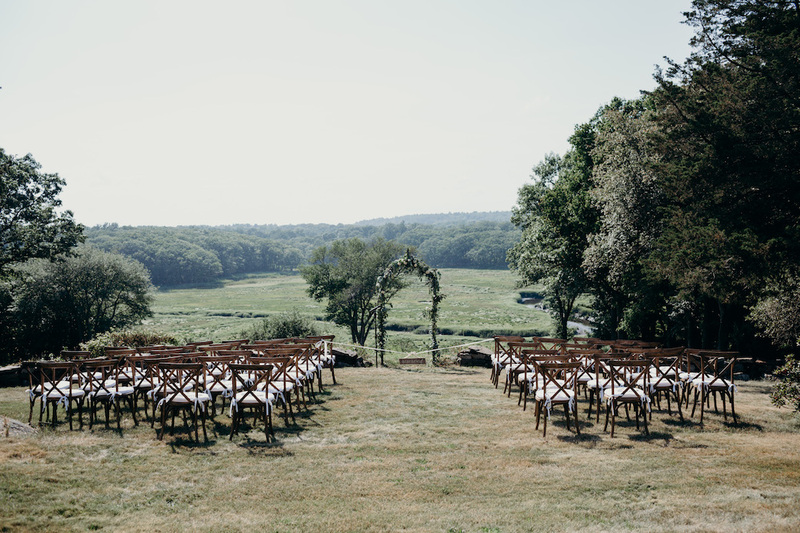 Mountain views are complemented by a private forest wedding ceremony site atop Wachusett Mountain Farm. This venue offers gorgeous views of the rolling hills from the farm and pastures cleared a top the hills. With a classic red New England barn, horses and beatuiful farmstead with a wraparound porch perfect for photos with your bridal party or guests to sip drinks and munch on apps. Within the acres of private forest the available ceremony site is just steps from the farm and parking area, but the dense forest wall makes the wedding site feel like you are miles from a city or the hustle and bustle of daily life. Combining farm and forest is a perfect option for the couple looking for a more rustic wedding vibe! 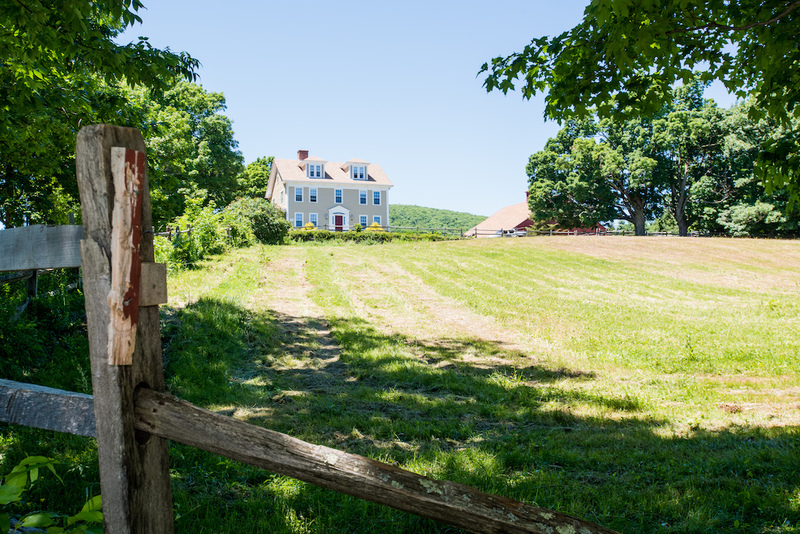 Plus, while it is the country feel for guests and couple, Wachusett Mountain farm is only 45 minutes from Boston and Logan airport. Forest? Hilltop? River views? Yes. Yes. And Yes, at the Essex River Estate. A historic horse farm and stable, the property encompasses acres of trails and fields along the gorgeous Essex River and marshlands. You guests can enjoy stunning vistas of river while hidden under the shade of oaks and maples. You can have a quiet ceremony with river and forest backdrops or a full "woodsy" forest wedding in the one of the many clearings among the oaks. This bucolic forest with its private setting is only a stone's throw from historic downtown Essex with its antique shops and natural hiking trails along the coast for guests. Want a private forest wedding but also kind of love the idea of getting married at an organic farm with some delicious farm-to-table foods and breathtaking mountain views for your guests? No need to choose, just get married at the Berkshires View Organic Farm and Orchard and you can have both. The farm has acres of private forests with fields winding throughout. The edge of the forests lead to acres of farm pasture with stunning vistas of the Berkshires Mountain Range. A small path leads guests from the farms rows of blueberry bushes back through poplars and pines to a small footbridge that allows guests to enter a large field cleared within the trees. You can do a ceremony, cocktail hour or reception here with easy access back to the main farm area. Of course, if apple trees are more your style than pines and oaks, the farm even has a small orchard (with a modern guest house that has a porch you can even pick apples from). If these top five weren't enough to satisfy your forest wedding desires, check out the rest of our great nontradtional woodsy wedding venues here.